G7 - What it is and Why it's Important | Pengad Indy Inc.
G7 is a process to calibrate printing equipment to provide the highest possible color match with less preparation and waste, ultimately providing a higher quality product at a lower cost. The calibration also allows printers to print the same piece on different presses an achieve easier, faster and more accurate color matching. This provides the proof to press color consistency. G7 certifications need to be renewed based on yearly calibration tests to ensure the equipment stays properly calibrated. There are four different G7 certifications with different certifications for facilities and individuals. Pengad Printing Inc is a G7 Master certified printing facility. G7 was created by IDEAlliance and the GRACol committee. The name G7 describes the way in which color calibration is performed: by measuring the image's grey scale using 7 ISO ink colors (Cyan, Magenta, Yellow, Black, Red, Green and Blue). Measurements are achieved through the use of spectrophotometry. Why Choose a G7 Certified Printer? 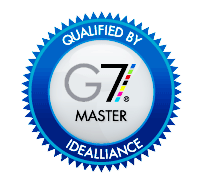 The G7 Master certification is a mark of industry leading quality. We understand that you want your piece to look the same regardless of what press or even what company prints it. G7 guarantees consistent and repeatable colors and images from proof to press, press to press and even facility to facility. The G7 seal is a mark of industry leading quality and technology. This certification is managed by IDEAlliance, to learn more visit www.idealliance.org. Gray balance is essential for consistent, quality color reproduction. Images that are not gray balanced are "casted." Casted images have appear to have a color overlaid in the image's shadows. A casted image requires color correction before a good quality print can be made. Quality color reproduction suffers if the images are casted and require on-press correction. While our pressmen are running a job they may look at the printed press sheet and see casts of too much cyan, magenta or yellow. If this is the case they have the ability to reduce whichever color is creating the cast. Although this affords an opportunity to correct problems by controlling the volume of ink it is too late to change the size of the dots on the plate (the tone value increase or TVI). The area on a plate where ink is transferred is not solid, it is made of tiny dots. The size of these dots are very important to color fidelity. It is impossible for a pressroom to have absolute control over gray balance and color with the wrong size dots on the plates. Without G7 quality controls pressmen would have to print a test at the required density and compare the scales against a standard with a reflection densitometer and adjust the plate values accordingly for each color. This process is both time-consuming and inefficient. By using spectrophotometry the G7 process drastically simplifies the printing process. The human eye sees light in colorimetric terms, the same way a spectrophotometer does. It measures colors in RGBi values, or additive color. However, printing inks on paper uses CMYKi values, or subtractive color. When your eye sees a printed color it is actually seeing white light bouncing off of a color. The color is subtracting its complementary color from the light source causing only the color you see to be reflected. The human eye is a very good judge of when printed material is off-color balance. Because a spectrophotometer measures wavelengths of color the same way a human eye does, it provides a perfect way to test printed colors. In order to achieve consistent color efficiently a different color model is needed to describe precisely what colors should look like, rather than specifying different percentages of RGB or CMYK. You still design in CMYK but we measure using the L*a*b* color model. CIE is the leading international authority on color. The organization is devoted to international cooperation and the open exchange of information pertaining to the science and art of light and lighting, color and vision, photobiology and image technology. CIE was created in 1913 and has since become a professional organization located in Vienna, Austria. CIE is an independent non-profit organization with strong technical, scientific and cultural foundations. Serving member countries on a voluntary basis, CIE has been accepted as an international standardization body by ISO. To learn more about CIE or to read some of their publications visit www.cie.co.at. The L*a*b* color space is based on the 1976 CIELAB color space created by the Commission Internationale de l'éclairage currently based in Vienna, Austria. This body is the international authority on light, illumination, color and color spaces. The L*a*b* system is designed on the XYZ color space developed in 1931 (see Color Theory Part II for more on the XYZ color space). The intention behind the creation of the L*a*b* system was to create a space that can be created out of the XYZ color space using simple formulas. Obviously this is all done by our computers in the background these days. The important key to the L*a*b* system is the idea of perceptual uniformity. The L*a*b* color space includes all perceivable colors. This means that its gamut exceeds those of both the RGB and CMYK color models. Even more important is the fact that the L*a*b* model is device independent. This means the colors are defined independent of where they are created and by what, this is not true for RGB or CMYK unless there is a color management in place. The bottom line is the L*a*b* color space helps you with your work all the time. Because the L*a*b* gamut exceeds both those of the RGB and CMYK color models programs like Adobe Photoshop use the L*a*b* model when you convert an image from RGB to CMYK for print reproduction. Softwares also commonly use L*a*b* as an interchange format between different devices because of its device independence. It is because of this device independence, among other reasons, that the G7 system uses L*a*b* values to certify the quality of your piece when it comes off the press. This does not change the printing method at all, process printing is still achieved with CMYK and spot colors are still spot colors. It is the analytical quality checks that use the L*a*b* color model to ensure accuracy and quality.